With an old scarf around my head keeping the hair off my face, and a wooden spoon in my hand, I opened the door to let out a cat. 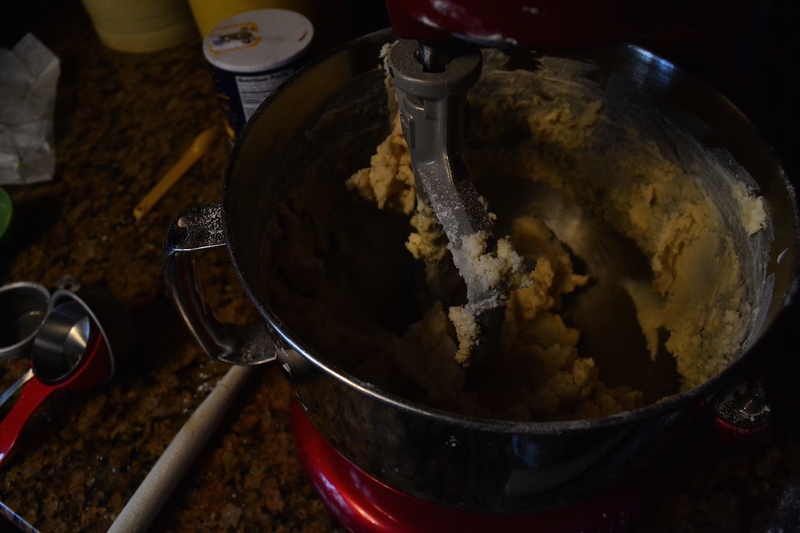 Sarah and I were in the kitchen making Christmas cookies. 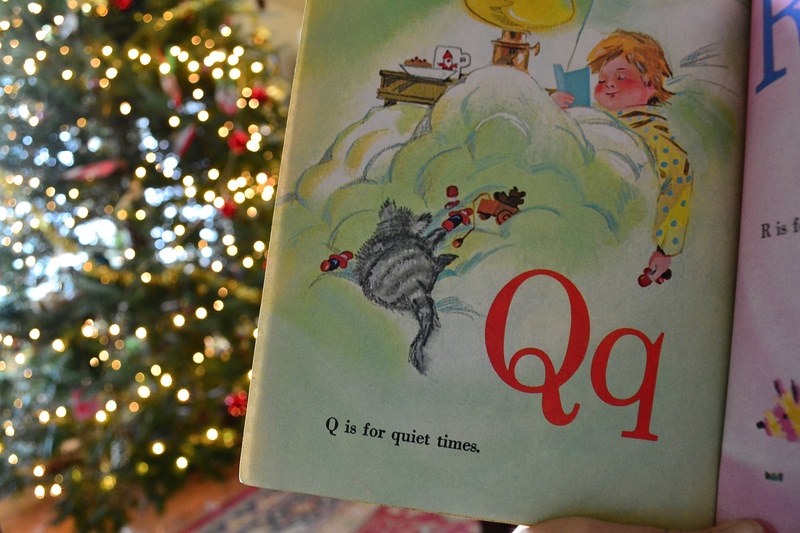 I had determined to have a quieter day. 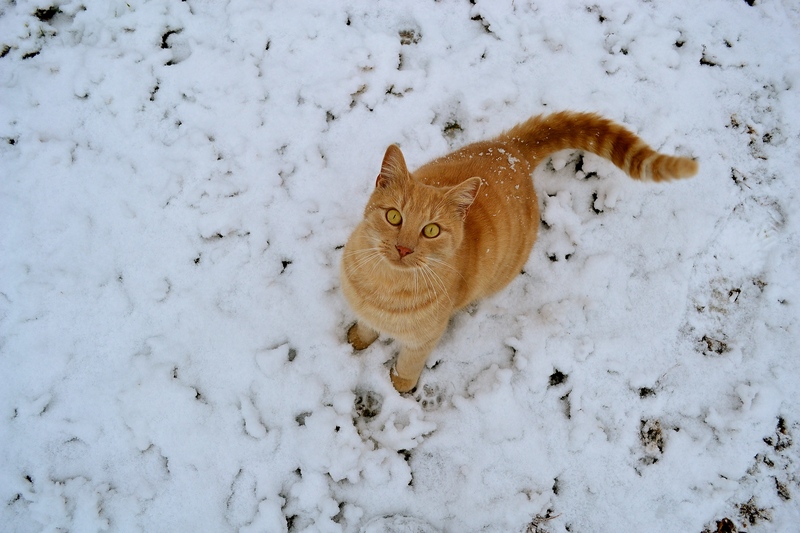 We had a pleasant snow fall in the night but not enough to keep the children home from school. 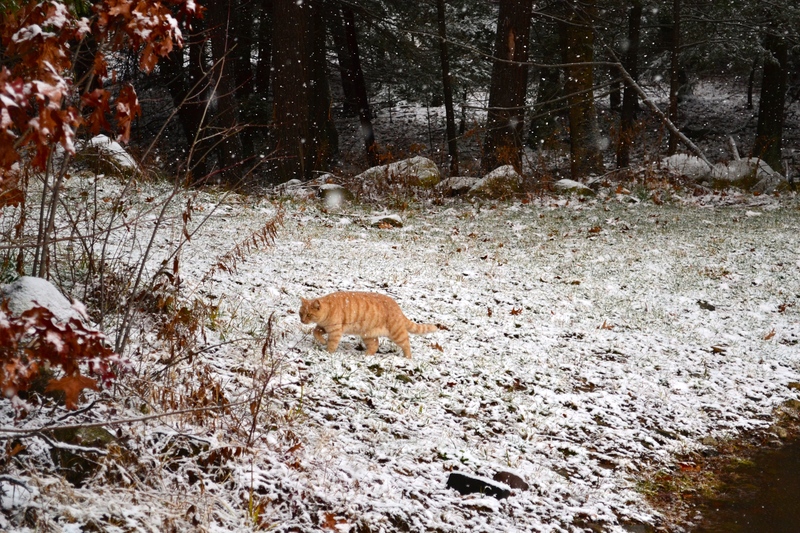 Ethan had a dentist appointment at 8:50 so Sarah and I left to pick him up…..while the snow continued to gently fall. 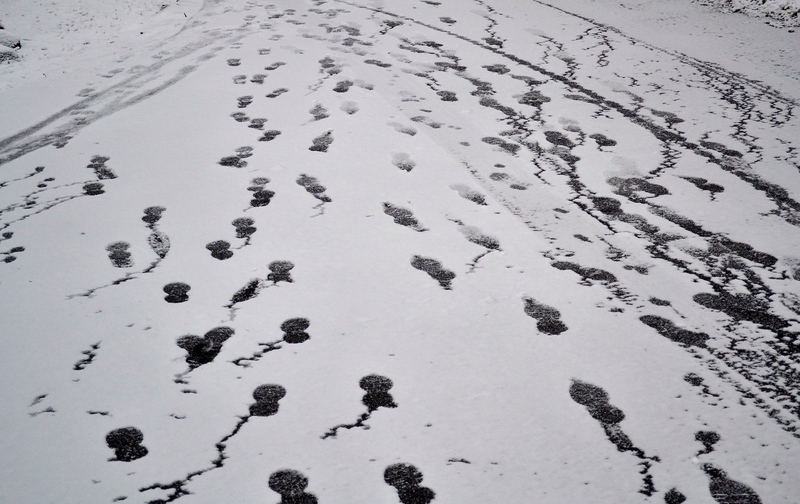 The many tracks in the driveway, made by the family I love, made me smile. So much activity belonging to the special boys and girls in my life. My husband’s truck tracks meant that he was already at work, making an early start so that he could get back to coach wrestling later at the High School. 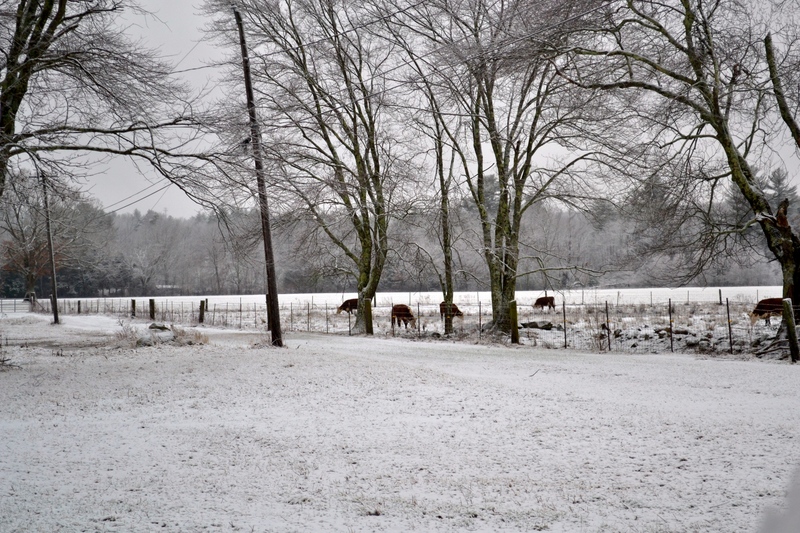 At the end of our road, I stopped to take a picture of the farmer’s cows in the snowy field. 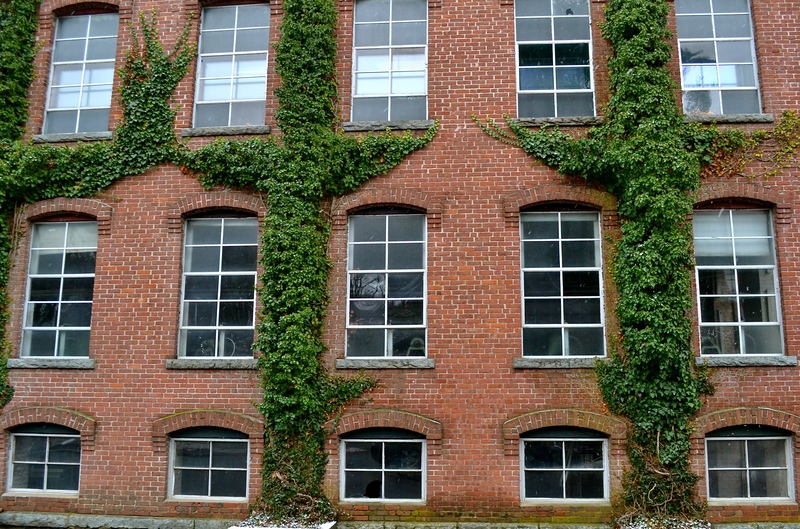 In town, Sarah and I both admired the ivy growing up brick buildings. She asked me if we could grow them on our house. Ethan is the one child that I nag the most about brushing his teeth. It’s become sort of a family joke although Ethan himself may not think it is funny anymore. He is in wrestling now at school and had to get his official weight taken today. I couldn’t even tempt him to a small hot chocolate after his cleaning. I took him back to school. 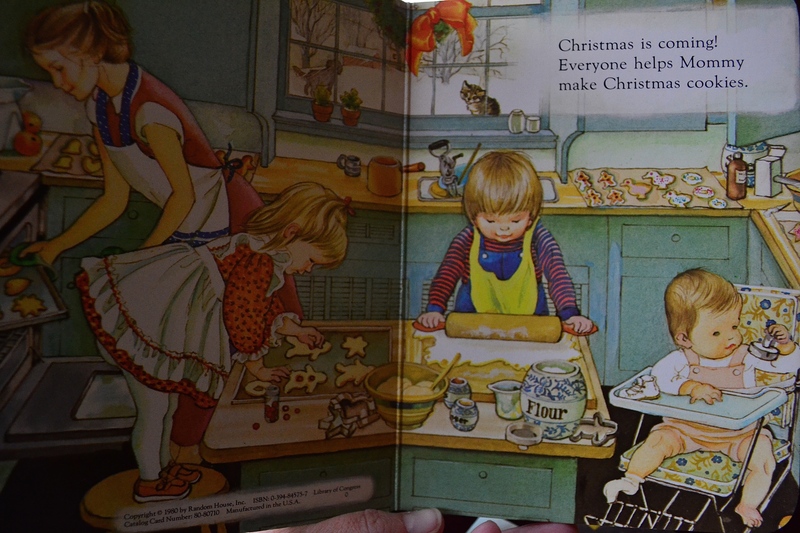 By that time it was only 9:30 so Sarah and I went to the Thrift shop and spent two dollars on some rubber stamps for the children to play with, a few books, & an ornament. We walked hand in hand to the car, over the railroad tracks. 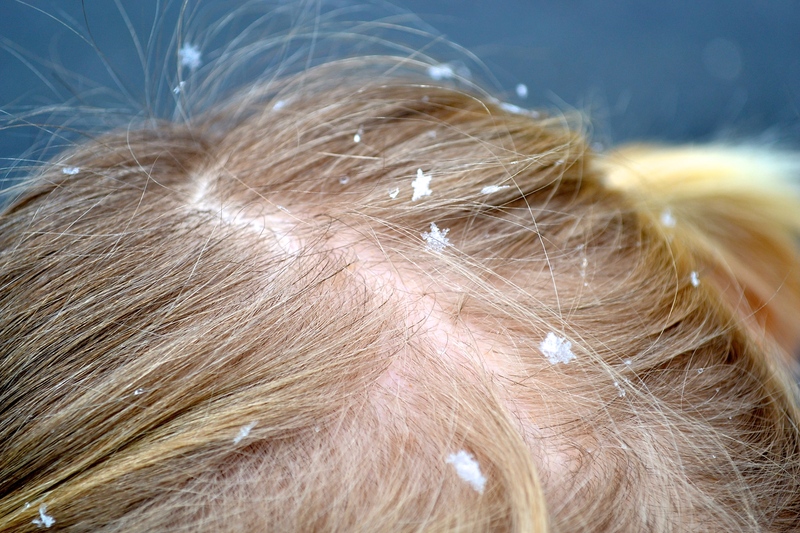 When we got there, I noticed that the snowflakes were falling from the sky as pretty as a picture on top of Sarah’s pigtailed head. In the parking lot by the town offices I stood with my camera, taking careful close ups of Sarah’s head and my own arm! I had to laugh when I realized what I was doing in public…..but the magic of it all…..
God is so good to me! I didn’t want to leave my cozy house this morning and when I remembered Ethan’s appointment I had groaned. But, in the midst of running these common errands of motherhood I was given yet another opportunity to see the simple beauty of a day I would have missed if I stayed inside. the soul of the sunbeam. We drove home and my mind was on the snowflakes and William Bentley. 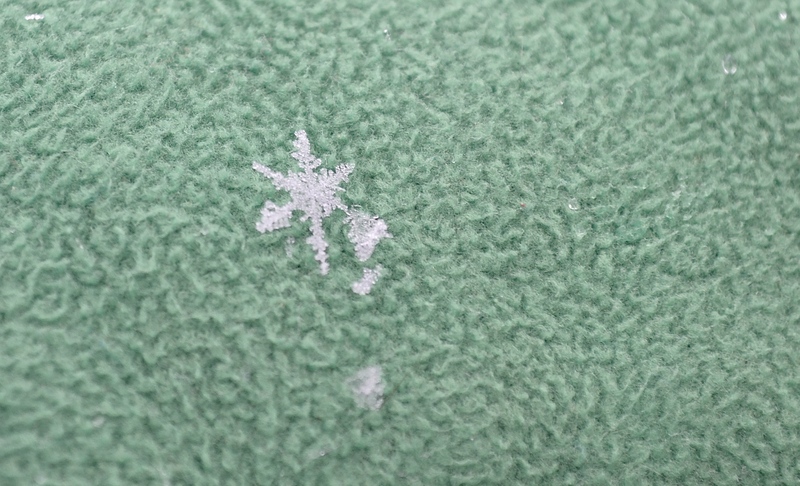 If you’ve never taken a picture of an individual snowflake I encourage you to try it! 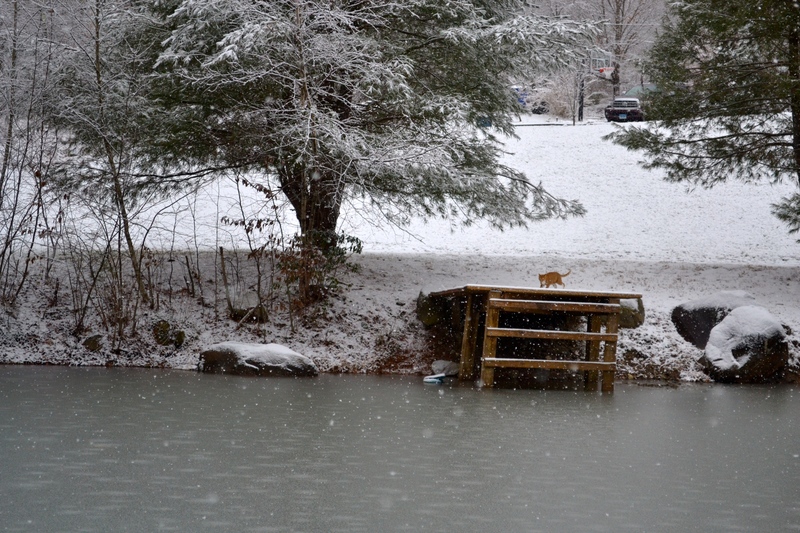 I meandered around the yard and our cat Sherlock tried following me across the ice on the pond and fell right in the water. It was rather shocking for us both. He swam back out quickly, which was a good thing because I was on the other side of the pond. 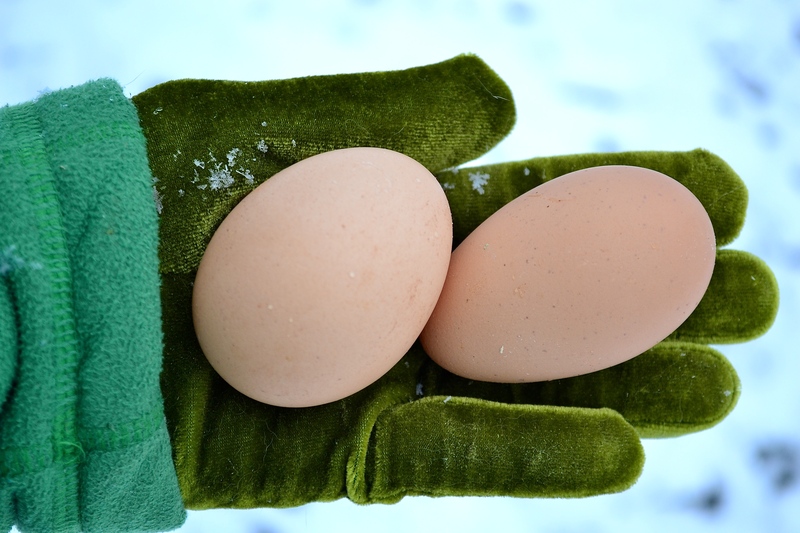 Two fresh eggs were waiting for me in the chicken coop. 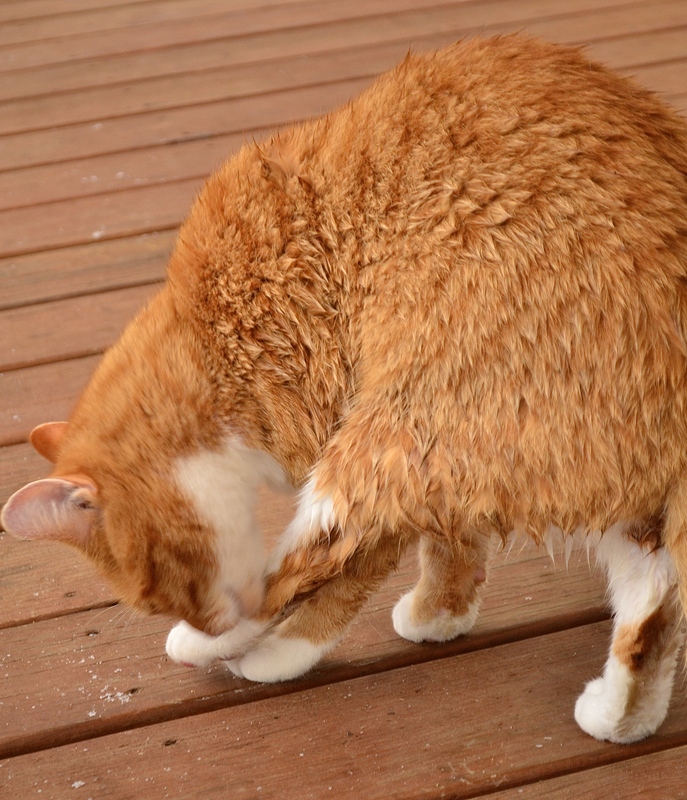 Sherlock was very busy on the porch, trying to clean the water off his fur. 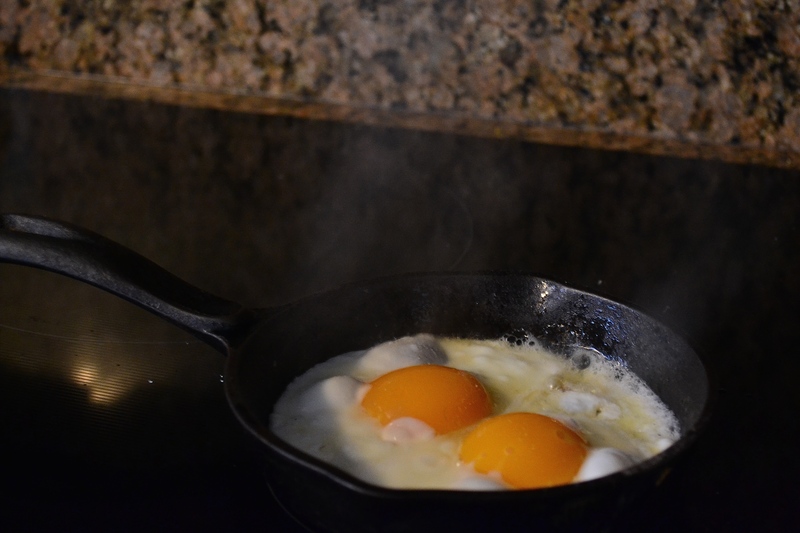 Sarah was already inside and we fried up the eggs and shared them for a snack. 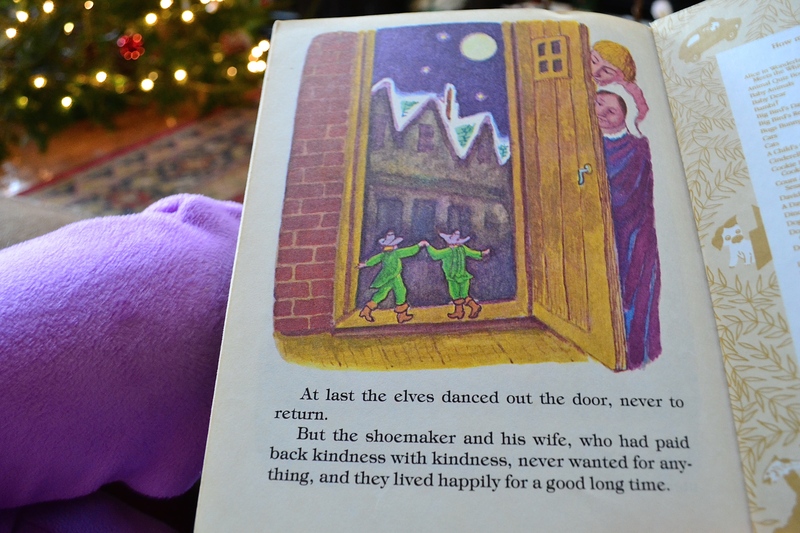 And then we read the books we had found at the Thrift store. And were inspired to be as kind as the shoemaker and his wife. 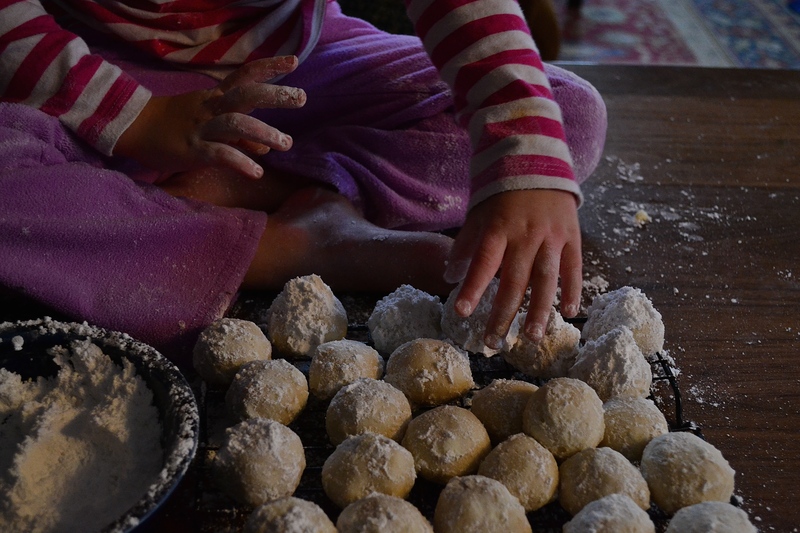 Best of all, we decided to make Christmas cookies, after a cozy nap. While the oven was still hot, I mixed up a banana bread. I read on allrecipes.com that if you wrap up your *hot from the oven* quick bread in foil, it will steam itself cool and become nice and moist. This entire morning *after the children left for school* has been a “no TV” day and the quietness of the house has been wonderful. 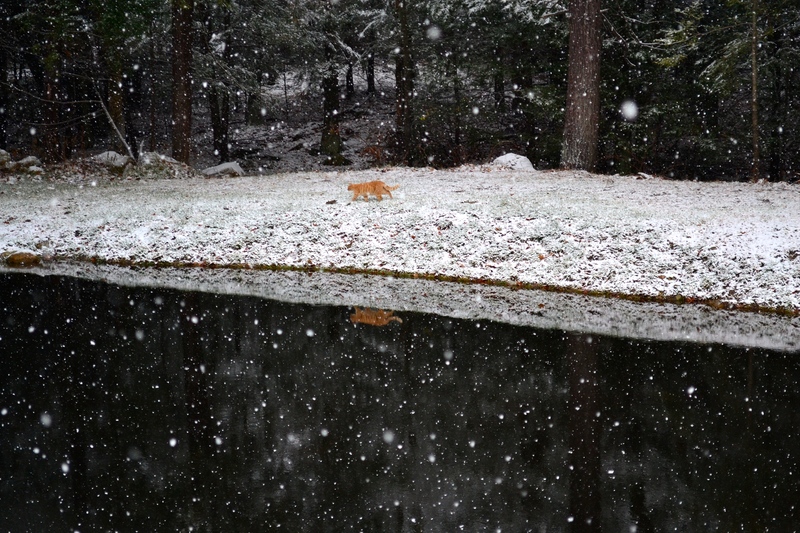 There is something about snow falling down outside to make a day seem so peaceful. 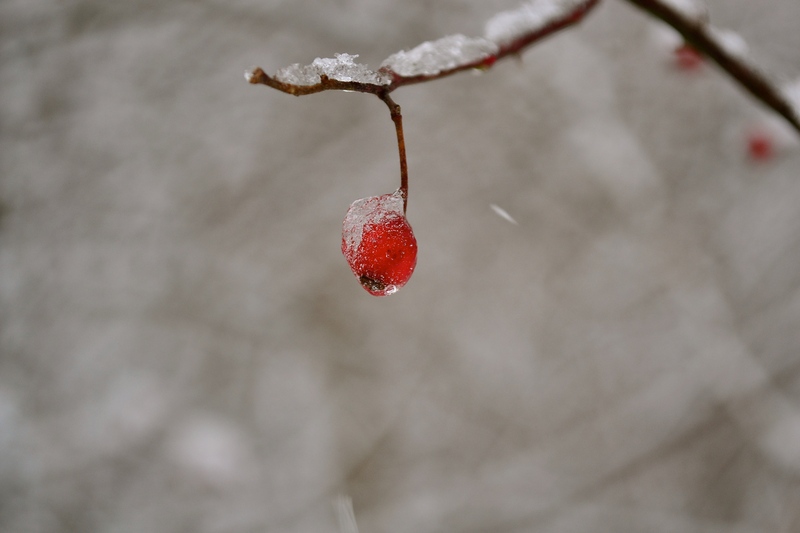 This entry was posted in a simply lovely life, it's the little things and tagged 25daysofChristmas, nature, sarah joy, snow by Shanda. Bookmark the permalink. Love this! Your snowflake photos are so pretty! Beautiful!!! Love those snowflakes, and everything in this post. 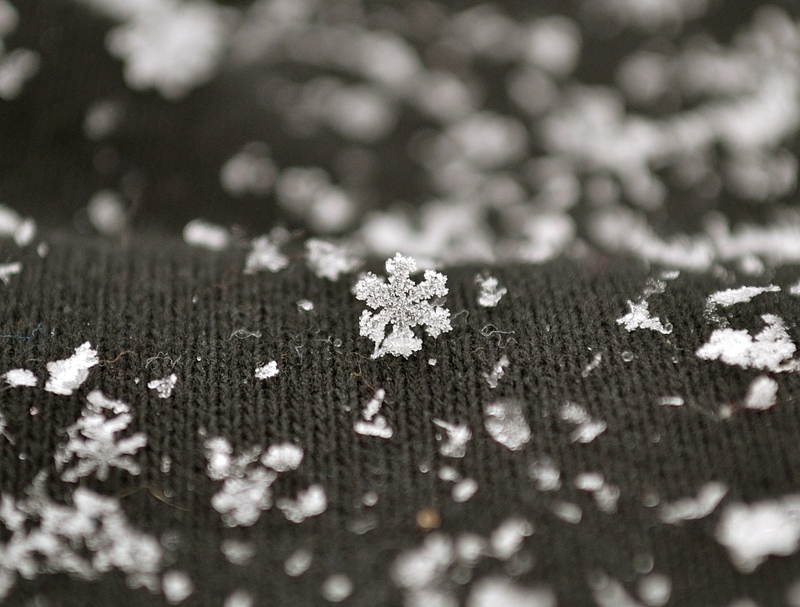 How beautiful your snowflake pictures are! I am so glad you notice the details,and then share them. 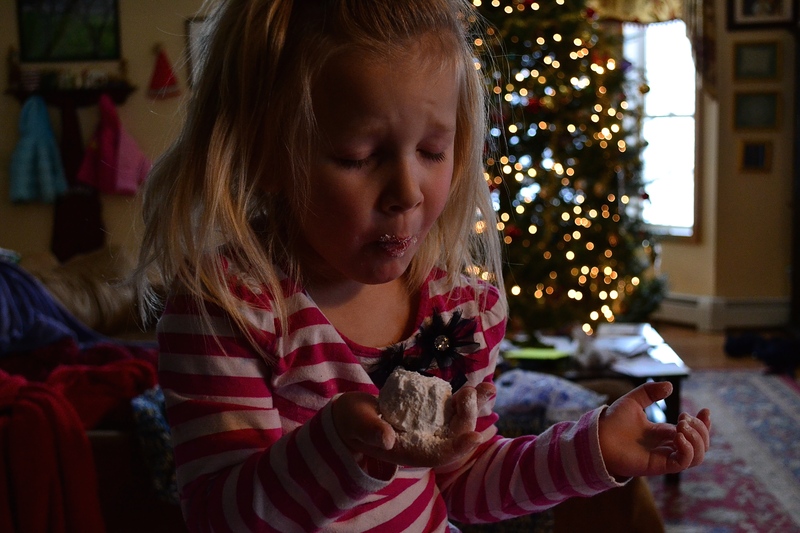 The cookies look yummy. 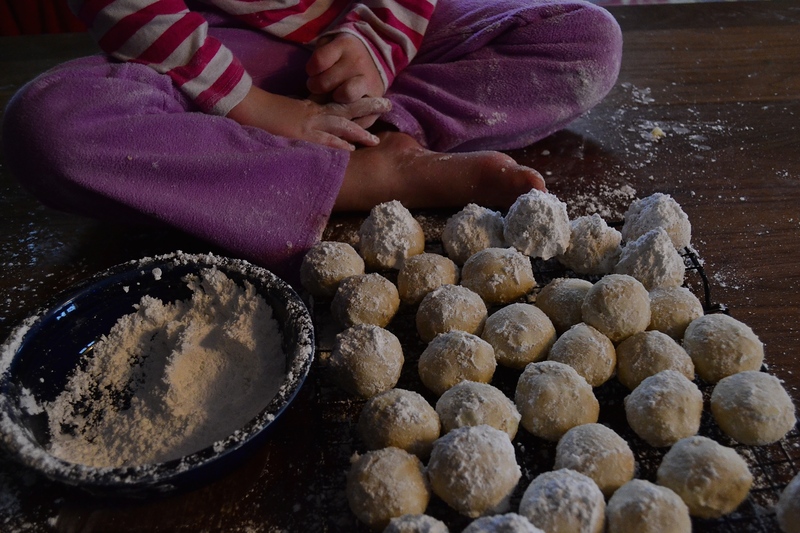 I need to make some that are OK for David and I. I found some that look like yours made with almond flour, that I think I will try. 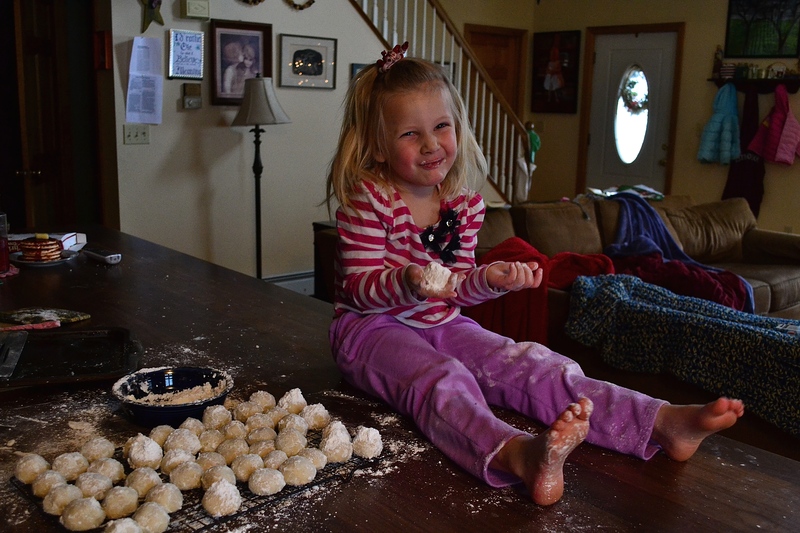 Your little helper looks like a cute elf with the dusting of sugar and her impish smile. So very beautiful! 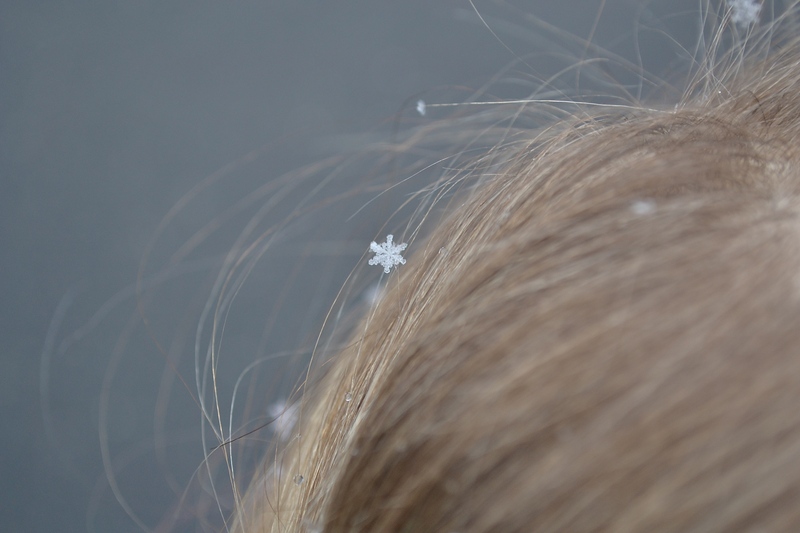 Thoes snowflakes in Sarah hair, the beauty of nature, thrifting, quiet time books and snuggles. … yes, God is good. Daily gifts. 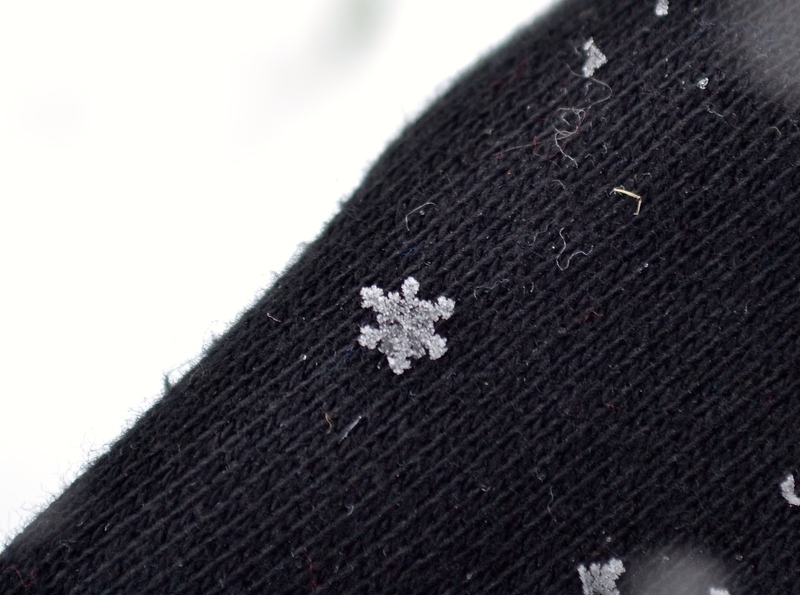 Those snowflake pictures are awesome! 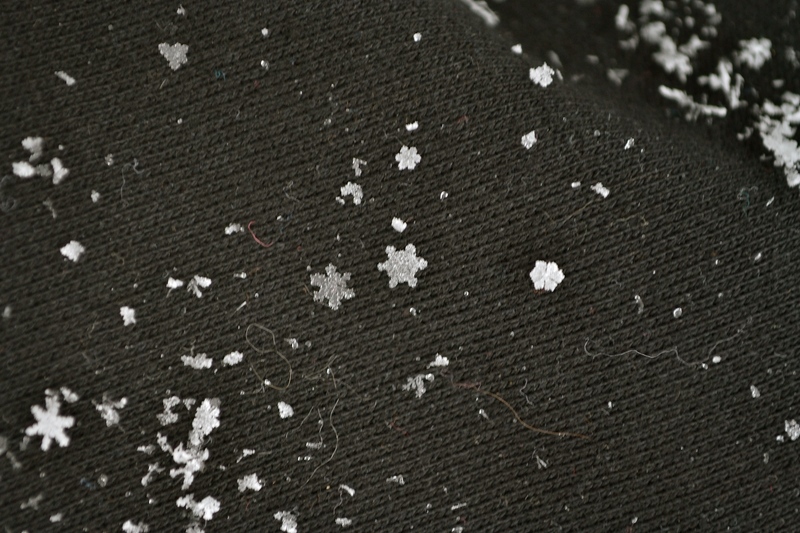 You can really see the details of the flakes. 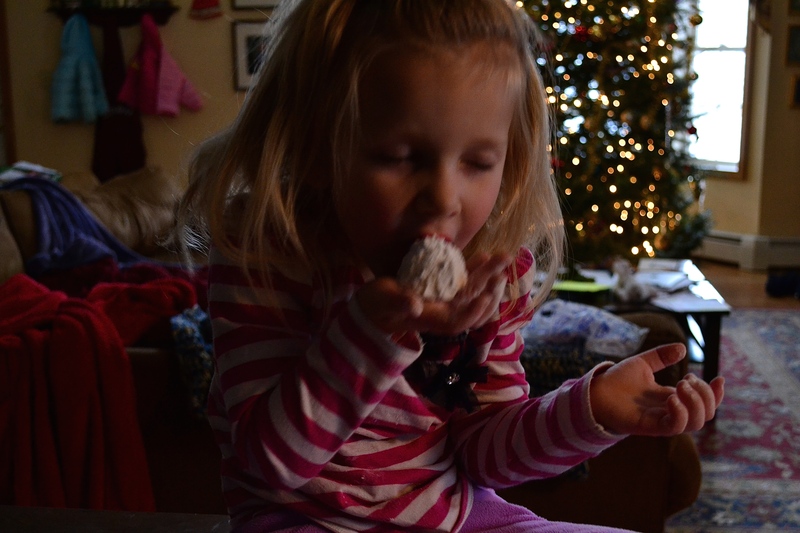 Marissa was over today and helped me when I was making fun get to cookies. We pack boxes and cookie trays at church tomorrow for needy families. 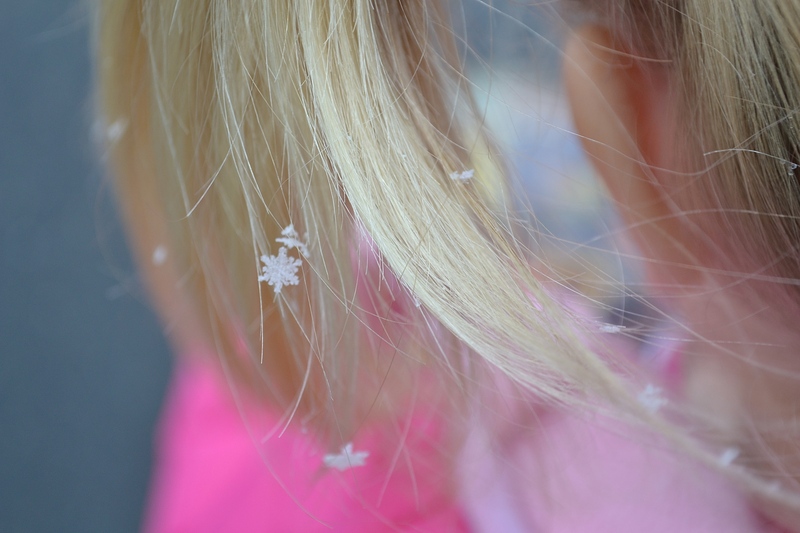 Those snowflakes are incredible! What a special gift. Thank you for sharing that. I loved this whole post. Thank you for sharing your day. Wonderful moments! Wow your camera is incredible! !